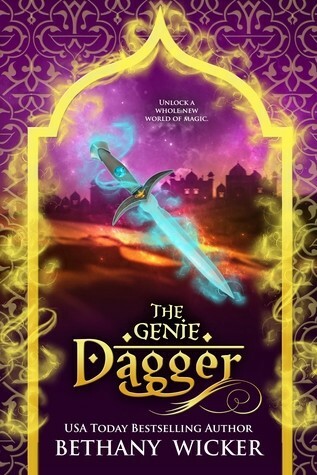 Today we're excited to chat with Bethany Wicker author of The Genie Dagger. Read on for more about Bethany, an interview, plus an giveaway! own. Visit her at www.bethanywicker.com [bethanywicker.com]. A magical dagger. An evil genie. A hidden past. In a land where genies and magic have been destroyed, Ara—a street rat—never anticipated stealing a magical dagger and it changing her life. When she wields it, she unlocks a whole new world of magic. Taron is used to starving. He feels the pains of hunger and the desperation of thirst every day. When a girl offers to help him, he thinks it’s too good to be true, but he quickly learns Ara is the best thief in Agora. Two street rats who are looking for a way out, Ara and Taron need each other more than they can imagine, but the dark secrets of Ara’s past won’t remain hidden forever. writing THE GENIE DAGGER, the plot took off on a course of its own. of the ideas for THE GENIE DAGGER came to me, especially the twists. about him. He's someone Taron can really look up to and learn from. actually. Like I said, I'm odd. thing you've learned as a writer from then to now? Melissa Craven, Kimberly Readnour, Michelle Bryan, and so many more. of Fools by Amanda Foody, and I could go on forever. then a unique Beauty and the Beast retelling. Being a mom to a two-year-old and still making time to write. The cover is gorgeous and reflects this exciting synopsis. I love the premise. Love the cover and the classic underdog synopsis. Congratulations on the new book.